I'm not sure if it was hubris or clarity that led Jason Blum, CEO of Blumhouse, to plaster the studio name before its new movie Blumhouse's Truth or Dare. There have been a plethora of other horror films within the past five years(!) with the same title so it could just be they wanted to tell us all that this one was the one from the people who brought us Get Out. Whatever the reason they should take it off as fast as possible. Sure, Blumhouse is known for its quick and dirty horror production, that's pushed out a ton of hits ranging in quality from classics to crummy, but none of those crappy films had the studio's name boldly emblazoned in front of it. And Blumhouse's Truth or Dare might just be the crappiest of their crappy movies, but now every time someone writes about it the studios name will be tarnished. 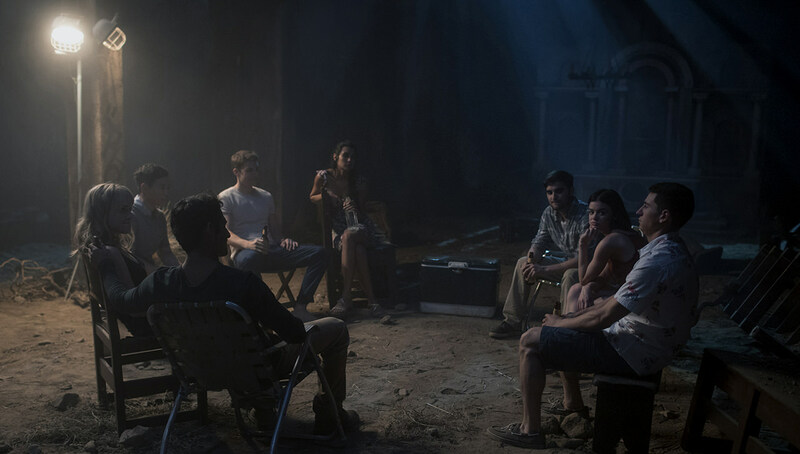 The plot of Blumhouse's Truth or Dare is pretty much the plot of every horror movie starring a group of 20 somethings or teenagers or young attractive people of any age that you've ever seen. They do something stupid -- in this case playing truth or dare in a creepy Mexican monastery -- and the evil comes after them until most of them are dead because of said evil. In this case it's an evil demon that possess the game of truth or dare making the idiots group of friends play the game forever, if they refuse or fail they die. This leads them to revealing terrible truths to each other and being forced to complete deadly dares that could lead to gruesome deaths. Oh, except wait. This movie is rated PG-13, because god forbid a movie that should be about a group of idiots dying gruesome, creative, and bloody deaths should have any gruesome, creative or bloody deaths in it. Look, you can pull off horror with a PG-13 rating, but when your entire premise is set up to kill off people and their deaths are the only possible redeeming value any of them have has characters then you better be coating the damn screen in blood. Instead Blumhouse's Truth or Dare offers all the incredible thrills of a girl walking along the edge of a house drunkenly and... ummm... I can't even think of the other ways people die. Someone gets shot I think. Happy Death Day, another Blumhouse movie, had this issue as well, but at least its concept was relatively interesting. This film has literally nothing going for it. The concept is pretty crappy in general, and plods from one dare to the next without any of them being interesting or scary. Mixed in is the drama of a group of college students, who it is impossible to care about in any way, telling each other hurtful truths you don't care about because IT IS IMPOSSIBLE TO CARE ABOUT THEM. If the movie dared me to care about its characters I would be dead. It doesn't help that the film's signature scare tactic isn't anywhere near as creepy as the filmmakers think it is. When someone becomes possessed they get a big Joker-smile-looking face and their eyes turn red. It could be scary, but it mostly just looks goofy, and the CGI used for it is almost as awkward as Superman's mustache removal. The film relies heavily on it being creepy to stir up scares, but since it isn't the movie's scary moments are only as creepy as you find people smiling to be. And now I'm going to spoil the ending of the movie because hopefully that will stop you from seeing it, and you can go home and stare at that spot on your wall, which is a way more entertaining way to spend 100 minutes. In the end the two people you think are going to live live, but they do this by cursing the entire world via YouTube. I think this was supposed to be a sort of shock thing, but it literally makes 90 minutes of boredom turn into ten minutes of anger. Anger that you sat through this crap just to watch an ending so dumb. It's not just dumb in that our two leads are being selfish assholes, it's dumb in the context of the film itself because the only character development that has been done at all has established that this would not be the choice of either of these characters! I just don't know what could prompt the creation of this film. I know a stupid horror movie isn't something to get too upset about, but as a fan of the genre I have to wonder why someone would want to bore their loyal audience to death. Is that the true horror of this film? Is Blumhouse's Truth or Dare actually an elaborate dare in and of itself? Maybe the entire Blumhouse production team played truth or dare in the abandoned monastery and this movie was what they were forced to make by the curse laid upon them. That must be it, because otherwise I can't believe the studio that has built its reputation on horror would ever release this.